At rare moments in time a library can have a singular impact on history. The recent release of George Clooney’s film Monuments Men (2014) has triggered an interest in the role that the Frick Art Reference Library played in the preparation of maps identifying works of art at risk in Nazi-occupied Europe. For the first time in history a belligerent was taking care of cultural treasures in a war zone. Initially, the concern was that Allied bombing might damage or even destroy irreplaceable cultural treasures. This was articulated first by the American Council of Learned Societies (ACLS) who in June 1943 accepted Helen Clay Frick’s offer of the use of the Frick Art Reference Library, 10 East 71st Street, New York, which Helen had founded in 1920, in their endeavors. This was the only time in its history that the Library was closed to the public (15 July 1943- 4 January 1944). Under the auspices of William B. Dinsmoor (1886-1973), Chair of ACLS Committee on the Protection of Cultural Treasures in War Areas, which predated the Roberts Commission, lists of cultural treasures were drawn up at the Library using its guidebooks — Baedeker, Touring Club Italiano, Guide Bleu etc. — and other resources, supplemented by what could be seen as an early form of crowd-sourcing, i.e. questionnaires sent out to academics and others who had recently visited Europe. Lists of monuments and art objects were compiled and marked on maps of the relevant area — the maps supplied by the Library of Congress, the Army Map Service, or the American Geographical Society. Some of the monuments were rated higher in importance than others: it is interesting to speculate what the criteria might have been. The monuments were numbered and their locations marked on a gridded tracing paper overlay over the map. These were re-photographed by the Library photographers, Ira Martin and Thurman Rotan. The photographic studio where this was done is now the Library’s conservation facility. 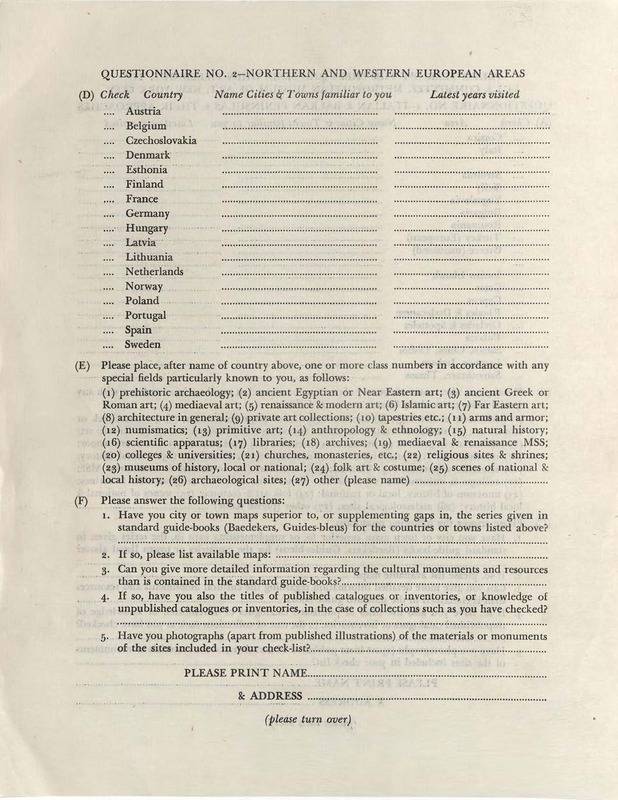 Sample questionnaire from the ACLS Committee on the Protection of Cultural Treasures, c.1943. The Frick Collection/Frick Art Reference Library Archives. Used by bomber pilots and navigators, then by soldiers on the ground directing artillery after the invasion of mainland Italy in September 1943 and France in June 1944, the maps were also incorporated into the Army’s Civil Affairs handbooks, which were issued to all officers on the ground. Later the lists and maps of treasures were used in the continuing struggle to return looted and confiscated portable treasures the rightful owners and their heirs. The Library’s resources including its Photoarchive are still used today for this very purpose. 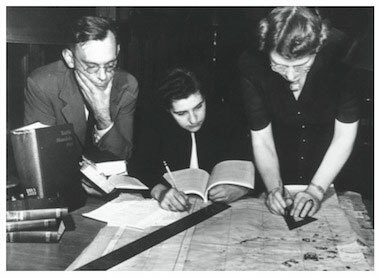 Some 700 “Frick” or “Treasure” maps were made, and in a letter, dated 12 October 1943, to Dinsmoor, Monuments Man, Theodore Sizer praised their usefulness in the field and the work of “those magnificent women in the Frick”. Dr. Stephen Bury is the Andrew W. Mellon Chief Librarian of the Frick Art Reference Library, New York, and is the Advisory Editor of the Benezit Dictionary of Artists.